‘Fortnite’/Epic GamesCompetitive ‘Fortnite’ continues to grow with in-game tournaments and esports events. “Fortnite: Battle Royale” is adding tournaments to its roster of in-game events. Tournaments will have different formats spanning several days; players earn points based on performance and will be matched up with others at their skill level as the tournament progresses. “Fortnite” developer Epic Games eventually plans to use the tournament mode to award prizes and help players qualify for more exclusive competitions. “Fortnite” is currently in the middle of the Fall Skirmish, a competition among 500 top players, with a $US1.1 million prize pool. Epic Games has committed $US100 million in funding for “Fortnite” competitions during the 2018-19 season. “Fortnite: Battle Royale” will add a new tournament mode to the in-game events menu, giving players across all platforms a chance to play against each other in a competitive format. According to developer Epic Games, tournaments will be open to all players and will eventually be used to award prizes to top players and help them qualify for future “Fortnite” esports events. Tournament competition takes place over the course over several days with different formats. 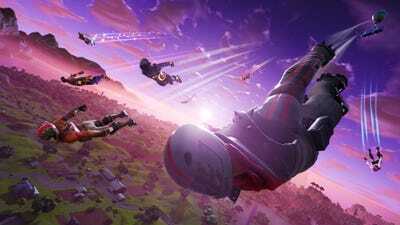 Players will be awarded points based on how long they survive, and how many players they eliminate during each battle royale. Teams or individual players with high scores will be placed in matches with other high ranked players for a greater challenge, while those who struggle will be placed alongside beginners. Each tournament will have a target score and players who reach the target will earn an in-game pin to mark the achievement. Tournaments will pit players from all platforms against each other, from PC to console to mobile devices, regardless of whether they use a regular controller, mouse & keyboard, or touchscreen controls. In the statement announcing in-game tournaments, Epic Games said that players will be on an even playing field regardless of what device or control scheme they prefer. Epic says that grouping everyone into a single competition group will increase visibility for the best players and help increase prize pools. They will continue to monitor competitive results and are already considering limiting some esports competitions to specific platforms or control devices in the future. The first in-game tournament will be a event for solo players running from October 16 to October 21, and the second will be a “duos” tournament for partners playing between October 23rd and October 25th. ‘Fortnite’/Epic Games‘Fortnite’s’ Fall Skirmish event series will culminate at TwitchCon 2018. “Fortnite” is also in the middle of its Fall Skirmish event, a series of weekly competitions with $US10 million in prize money on the line. Epic invited 500 “Fortnite” players to compete in the event, dividing them into five different teams for the six-week skirmish season. The teams will split $US4 million in prize money and players can earn points during skirmish events to improve their team’s share. The rest of the $US6 million prize pool is awarded to the winners of specific events each week. The Fall Skirmish will conclude with a pair of in-person tournaments at TwitchCon 2018, held at the end of October. The first will be an open duos competition with a prize pool of more than $US1.1 million split between the top 50 teams; the winning team will receive $US400,000. The second competition will be an invitational event for 50 Fortnite content creators and 50 random TwitchCon attendees with another $US350,000 in prize money. You can watch the Fall Skirmish events each week on the official Fortnite Twitch channel. Nearly 80 million people played Fortnite during the month of August, and new content was recently released for season 6 of the game. Epic plans to invest $US100 million in prize money for the 2018-19 competitive season, which will include the 2019 Fortnite World Cup.